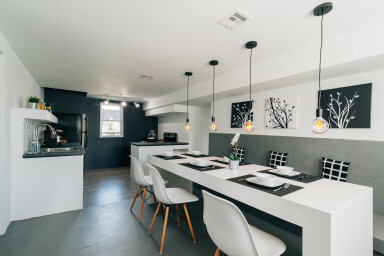 Experience the beauty of the Jersey Shore by staying at this bright, super modern and open Neptune, NJ home with 3 unique bedrooms and design! The house is just a 1.6 miles or 5-7 minutes ride to the beach in Asbury Park. If you’re planning a trip to the Jersey Shore, a weekend in the Jersey nature or a beach getaway, this Neptune home could be the perfect accommodation for you and your travel companions. It features 3 bedrooms (1 of which is without a door and super cool design) and 2 bathrooms with a stunning open floor grand room, a fully equipped kitchen, and a large back yard. - 3 Bedrooms with queen size beds. - Fully equipped kitchen with brand new appliances, wireless internet access, shared washer and dryer, flat screen TV, and much more. When you’re done spending the day out, you’ll love coming home to whip up your favorite recipes in the fully equipped kitchen, complete with new appliances and beautiful laminate floors. Share a meal with your friends and family at the dining room table, or take your plates outside to the backyard table. You'll have full access to the house including the shared (with the unit next door) washer/ dryer in the basement. PARKING: There is driveway space for 2 cars and plenty of street parking available.